Nearly two decades after authors Pine and Gilmore first introduced the term “Experience Economy,” perfecting the customer experience remains a vital mission for marketers. In the restaurant industry, the notion of “experiences” is typically reserved for the high end — i.e., the fine-dining experience. Yet today’s Experience Economy is an egalitarian one: Every consumer, no matter the class or age group, feels entitled to an experience and views almost every brand interaction through the lens of that experience. Across the eatery spectrum, there is an opportunity to dial up the experience quotient, increase ticket sales and build enthusiasm for brands. These insights lie at the heart of our newest Catapult research study: Experience Counts: Unmasking the Drivers of Brand Preference in the Quick-Serve and Fast Casual Restaurant Category. Through a two-part survey that isolated the reported influences (stated intent) from the derived importance (actual drivers) of various chain attributes, we drew several important conclusions about what is really driving consumer preferences in the category. The key finding: The self-reported influencers — type of food, location, speed of service, and affordability — were superficially connected to brand choice; the true drivers of brand preferences are experiential. Numerous studies have shown the interplay between conscious and subconscious influences on decision-making; and where to eat is just as impacted by that interplay. 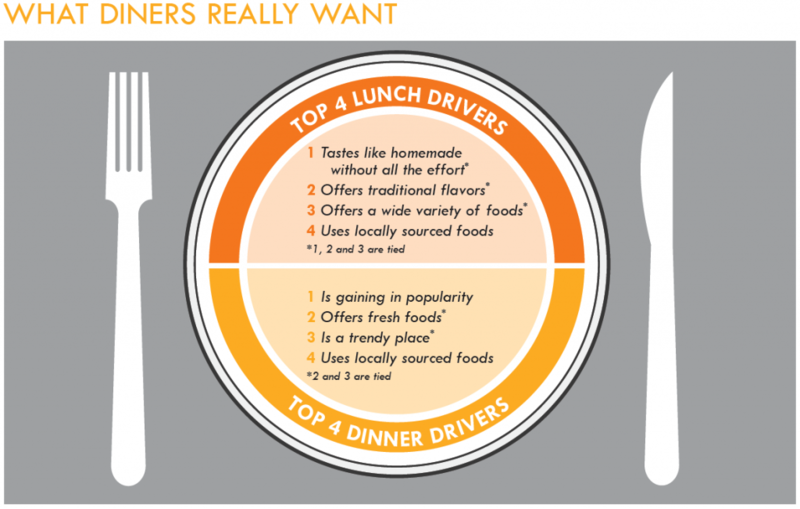 In other words, what consumers say they want from a restaurant meal is not necessarily what determines where they dine out. “The back and forth about ‘where to eat?’ isn’t a rational or functional conversation,” observes Molnar. “There are deeper emotional layers that drive brand selection.” This dynamic has significant implications for investments in product research, menu development and marketing for a QSR (and Fast Casual) industry that is expected to surpass $141 billion in global revenue by 2019¹. In phase two — a SolutionScan™ study with over 2,000 U.S. consumers — respondents were asked to list restaurant brands they considered and preferred. Next, they were asked to rank a list of attributes on a 9-point scale based on how important those attributes were to them. Finally: “Based on what you know, how well do you feel each brand fits with the attributes?” A regression model compared the attributes that differentiate the preferred brand from the remaining brands, allowing researchers to produce the derived importance of each brand attribute. Millennials are a primary consumer target for QSR and Fast Casual marketers, given their vast collective spending power and tendency to dine out more frequently than other age groups.1 At the same time, Millennials also tend to be more cost-conscious than older consumers. Indeed, affordability ranked highest in reported influence among the 18-34 year-olds in our survey. When we dig deeper into what Millennials truly want from restaurant brands, however, the picture becomes more complicated. Millennials like to try new things and often use social media to share food experiences with friends and family, and this may heavily influence their choice of restaurant. 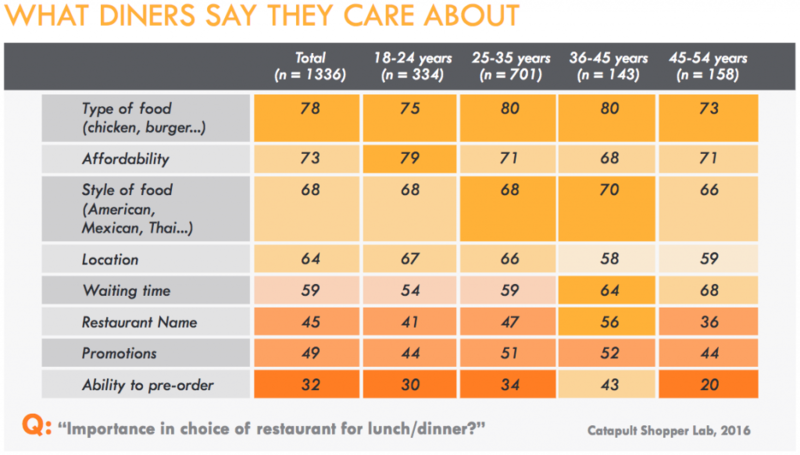 Seeking “a trendy place” topped the list of attributes in derived importance for both the younger (18-24) and older (25-34) sub-groups in the survey, while “introducing new food options” was shown to be slightly more important for the younger of those groups. On the other hand, attributes such as “wide variety”, “great tasting foods” and “foods you crave” were not as influential. “Millennials came of age in an experienced-based culture, so their expectations with regard to customer experiences are much higher than those of other groups — and that is part of what’s driving them to constantly try new things,” observes Brian Cohen, EVP, senior group director and head of digital integration at Catapult. Cohen contends that QSR chains need to think about ways to dial up the “experience and experiment” factor in order to win over today’s younger consumers. That can be achieved through menu innovation — for example, by integrating new or unexpected ingredients, such as the quest for the new Sriracha (with Gochujang as the current front-runner) — or by making the order-ahead process more fun and expedient through an exciting new mobile program. QSR and Fast Casual chains can also look to the broader food industry for ideas — such as promoting healthier menu items — that will appeal to Millennial customers. Such findings don’t always translate to consumers’ preferred choice of restaurant, however. For example, in our survey, “offers healthy foods” was determined to be a relatively low priority (for both lunch and dinner) within all age groups. By contrast, transparency in food practices is significant. For example, use of locally sourced foods and ethical treatment of animal-based ingredients (e.g., hormone free, antibiotic free, cage free) were both shown to be much more important drivers of brand preference across the board. Once all of the survey results were in, we asked ourselves: “If marketers can improve on the most influential choice drivers, how much of an impact would it have on their performance?” For lunch, the answer was quite a lot. Through the regression model analysis of the derived importance rankings, we determined that each of the top three attributes — “traditional flavors”, “homemade taste without the effort” and “offering a wide variety” — had the ability to increase preference for a QSR or Fast Casual brand by 9% with just a 1-point improvement in that brand’s association with that attribute. For dinner, where there were a greater number of secondary drivers, the impact of the top four brand attributes was more diffuse: Each could increase preference for a brand by 2-7% with a 1-point improvement in their association with that attribute. At a minimum, offer the type and quality of food that diners seek at a fair value. Stated importance of these factors is high, because they’re the minimum requirements to get in the consideration set and become part of the conversation. Consider enhancing subliminal behavioral cues. Atmosphere counts. Think about how music selection, lighting, décor, table layout, traffic patterns and menu design all influence menu choices and create a better customer experience. 1. Offer quality food at a fair value. 2. Move beyond functionality and connect to the unique emotions of the dining experience: It’s not just about the food. 3. Introduce value-added content that enhances the overall customer experience. 4. Spread innovation from product development to menu design to staff training up and down the organization. 5. Add subliminal cues to nudge customers inside the restaurant: Atmosphere counts.